The Journal of Gerontology: Medical Science recently reported that women who are caregivers for ill or disabled relatives may be at risk for stress-induced illnesses. However, significant improve­ment of their health may be gained by exercising four times a week. Caregivers who exercised were found to sleep better, have lower blood pressure, and a lower risk of heart problems. Recent statistics published by Children of Aging Parents (CAPS), reported that over 25 million Americans provide unpaid, long-term care to loved ones. Caregiving is more than a one­person job, yet one family member most often carries the responsibility alone. The National Family Caregivers Association reports that family caregivers provide over 90% o of all long-term health care in America. 20% of adults provide care to a family member. Another 23% expect to become caregivers in the future. 75% of caregivers are women. 76% of intense caregivers say they get no help from other family members. A 1999 study estimated the value of unpaid health care provided by family caregivers at $196 billion a year. TAKE CARE!, a publication of the National Family Caregivers Association, recently posed to its readers the question, "How do you renew yourself?" One caregiver with a chronically ill parent responded, "I know how important it is for me to take care of myself. I am kind and gentle with myself. I do not respond to must, should, have to, or ought. I pay attention to my feelings, to what my body is saying. I listen to my inner being." A caregiver whose parent has multiple disabilities stated, "I love reading, listening to classical music, work­ing in my yard, and being physically active. I keep working these things into my daily or weekly schedule. I enjoy nurtur­ing and being nurtured. This reminds me that I chose to take on the primary care of my mother. I know what activities and situations drain me and which energize me. As much as possible, I keep the former to a bare minimum." The caregiver of a father-in-law with chronic disabilities reported, "I do it in several ways, depending on how stressed I am or what situa­tion caused my stress." After giving a list of activities, the caregiver elaborated, "There are times when nothing seems to help. Those are the times I pray. Believe me, I pray a lot." Exercise, take a walk, swim. Send a note, letter or e-mail to a friend. Belong to a caregiver support group where you can talk to others in the same situation. Get away for an afternoon and shop, go to a movie, or visit a gallery. Seek spiritual renewal through prayer. Diets and worry about being overweight are common concerns for millions of Americans these days. Conversely, caregivers and ill loved ones often suffer from not eating enough. Depression, a common problem in intensive level caregivers and those with chronic illness, tends to impact the appetite. Caregivers often tend to put their own health needs on hold and the situation can be dangerous. It is important to guard against undernutrition in the caregiver and the care recipient. Check with the doctor to find out the reasons for loss of appetite and to discuss proper treatment. Now we have a study that demonstrates that caregiving can. lead to mortality," said the leader of the study, Richard Schulz, a psychiatry professor and director of the University Center for Social & Urban Research at the University of Pittsburgh. Researchers tracked 819 spouses, ages 66 to 95. A total of 317 were responsible for helping a spouse move around the house, eat or go to the bathroom, or handled the part­ner's laundry, housework or shopping. Of those 317 caregivers, 179 reported strain. The strained caregivers had higher levels of depression and were less likely than other spouses to get enough exercise and rest or to see a doctor when they were sick. "Participants who were providing .care and experiencing caregiver strain had mortality risks that were 63 percent higher, -than non-caregiving (spouses)," said the study published in this week's Journal of the American Medical Association. Past studies have sug­gested that loss, prolonged distress, the physical demands of caregiving and the biological vulnerability of older people may lead to health problems in elderly caregivers. The spouses who needed care suffered from such ailments as arthritis, congestive heart failure, strokes and Alzheimer's disease. The strained caregivers, like the spouses studied, died of such things as heart disease, stroke, cancer, pneumonia and kidney failure. "My hunch is that these people are frail. They're relatively old. They have their own health problems generally," Schulz said. "By some estimates, more than 151 million adults currently provide care to relatives, saving the formal health care system billions of dollars annually," said the study. "It is essential that we develop treatment approaches for older marital (couples) that focus on the needs of both individuals simultaneously." The National Family Caregivers Association (NFCA) is a grass roots organization created to educate, support, and empower the millions of Americans who care for chronically ill, aged or disabled loved ones. 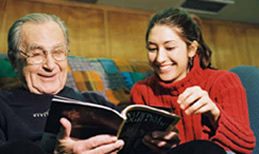 Family caregivers focus on their loved one's needs; NFCA focuses on family caregivers. Choose to take charge of your life. Don't let your loved one's illness or disability always take center stage. Rememberto be good to yourself. Love, honor and value yourself. You're doing a difficult job and you deserve some quality time, just for you. Watch out for signs of depression, and don't delay in getting professional help when you need it. There's a difference between caring and doing. Be open to technologies and ideas that promote your loved one's independence. Grieve for your losses, and allow your­self to dream new dreams. Stand up for your rights as a caregiv­er and a citizen.